This came together perfectly and made for a lovely presentation in parfait glasses. It just wasn't anything I'd make again. Can't quite put my finger on it, but something was off, maybe the combination of the three flavors, or maybe Grand Marnier was not the best choice of liqueur. This was just okay, and there are many better mousse, raspberry, and white chocolate recipes than this. None of my dinner guests were particularly impressed either, but for those who are going to give this recipe a shot my suggestion would be to try Cassis, or Chambord, or leave the liqueur out altogether. Process berries in a blender or food processor until smooth. Strain mixture into a small bowl and discard seeds. Add sugar and liqueur and stir until the sugar dissolves. In a heavy saucepan on low heat, warm 1/4 cup of cream and white chocolate, stirring constantly until the chocolate melts. Let mixture cool until it is lukewarm. Stir in 1 tablespoon of raspberry sauce and food coloring. Transfer to a large bowl. In a medium bowl, whip remaining 1 1/2 cup cream to soft peaks. Fold into melted chocolate mixture, one-third at a time, until no streaks remain. 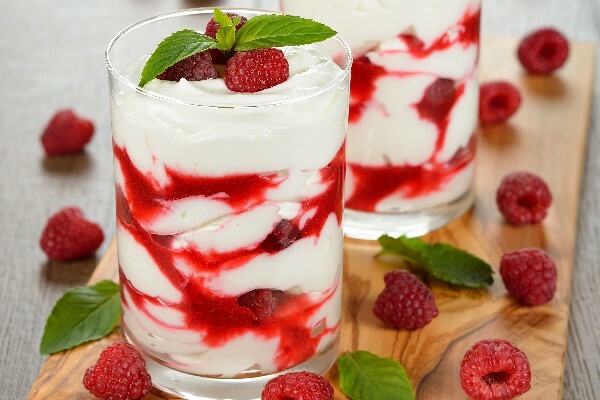 Layer into parfait dishes and serve with raspberry sauce. May also be used to fill or ice a cake.